Service operates between DART Central Station and Merle Hay/Haymarket Mall, including destinations at Veterans Hospital, Polk County River Place, Iowa Department of Transportation and Broadlawns Medical Center. Connections: Local Routes 3 and 60 at University Avenue. Local Route 14 at Hickman and MLK Parkway, Douglas and Beaver, and Merle Hay/Haymarket Mall. Express Route 91 at Merle Hay Mall. All Express Routes and the D-Line Shuttle on Grand Avenue and Locust Street in downtown Des Moines. All Local and Crosstown Routes at DART Central Station. 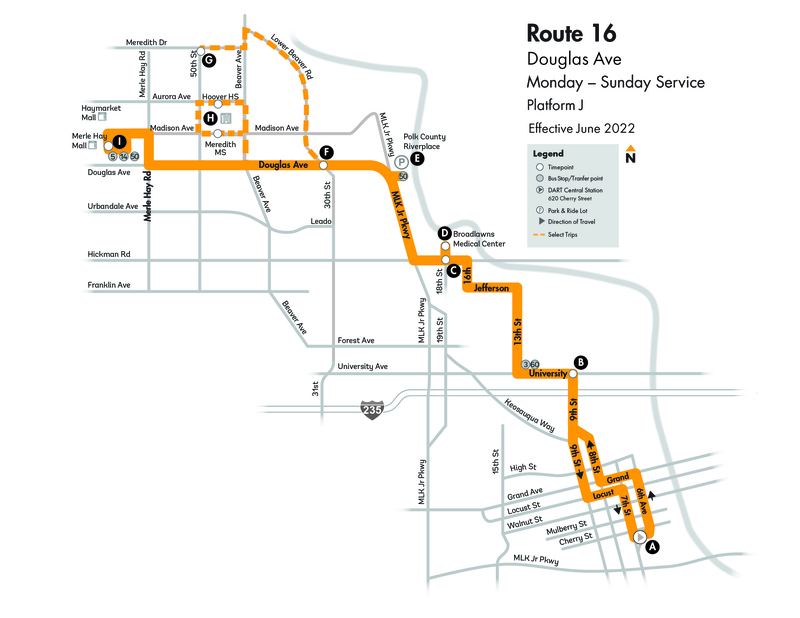 Guaranteed Ride Home: In case of an emergency, DART will guarantee a ride home to individuals riding Route 16 – Douglas Ave, extension to Lower Beaver Rd and Meredith Dr, between the hours of 8 a.m. and 3:30 p.m., Monday through Friday. To qualify for a Guaranteed Ride Home, you must be a monthly bus pass holder, Unlimited Access participant or RideShare vanpooler. For full program details, click here.